Esther will perform on Show 368 in Interlochen, Michigan on March 15, 2019. She previously performed on Show 320 with Trio Lago Verde in February 2016. 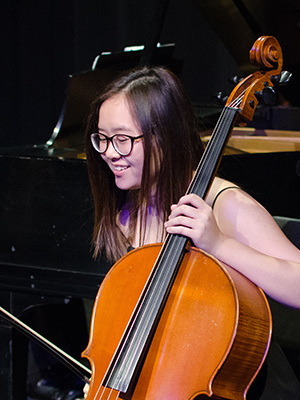 Esther Chae (cello), 17, a junior at the Interlochen Arts Academy, made her concerto debut with the Coral Gables Symphony age nine. A Jack Kent Cooke Young Artist and 2019 YoungArts Winner, she has been featured twice on From The Top, in addition to being broadcasted on Interlochen Public Radio, Wisconsin Public Radio, WLRN Television, and the Miami Herald Newspaper. Esther has performed with the Alhambra Orchestra, New World Symphony, Greater Miami Youth Symphony, New World Orchestra, and the Amernet Quartet in the Saint Martha-Yamaha Concert Series. Esther has earned acclaims in national competitions such as the Blount-Slawson Competition and the Kennesaw Young Artist Competition, as well as participated in masterclasses with world-renowned cellists such as Lynn Harrell and Judith Herbert at the Academy of St. Martin in the Fields. Trio Lago Verde consists of 13-year-old pianist Caleb Borick from Charleston, South Carolina; 14-year-old violinist Emily Hauer from Appleton, Wisconsin; and 14-year-old cellist Esther Chae from Miami, Florida. Both Emily and Esther will receive From the Top’s Jack Kent Cooke Young Artist Award. The three members met at Green Lake Festival Chamber Music Camp in Wisconsin in the summer of 2015. They are coached by Tom Rosenberg. Esther is a Jack Kent Cooke Young Artist.